Village School is a warm and welcoming place for girls to discover their strengths, find their own voices, and grow into confident, self-reliant, and intellectually curious learners. 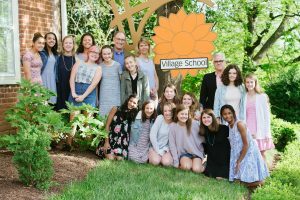 By providing the skills and support necessary to engage in a challenging four-year curriculum, Village School prepares girls to safely take risks and make responsible personal and academic choices. An all-girls environment allows girls to develop independent self expression. Enhancing the social, emotional, and physical well being of girls is necessary for a well-rounded education. Extending learning beyond the classroom walls and into the community fosters compassion and social responsibility. There is a balance between challenge and comfort. Content is related to past learning, connected to future learning and made relevant across disciplines. Students are motivated from within as well as by the interaction with peers and the learning environment. Students are able to reflect on the act of learning and intentionally employ techniques to further their knowledge. A variety of teaching and assessment strategies are employed. The community of students, teachers, and staff embraces the importance of learning and the power of knowledge.